In this continuing survey of the meaning and ramifications of ‘biological dark matter’, so far we’ve looked at the use of the term as an analogy, and the areas of biology where real ‘dark matter’ might yet exist, in the sense of more closely approximating to the analogy with physics (posting of 22nd March). Any light thrown on ‘dark’ corners of the biological universe might then produce a ‘paradigm shift’ (posting of 28th March) in the relevant biological field involved. Here, I’ll look at several other relevant issues, including the prediction of biological effects and its impact on so-called dark matter, and biological limits. Beginning to Expect the Unexpected? One point of view might hold that any finding that reveals ‘dark matter’ in a deep sense could only be that which was not at all anticipated. In other words, only the completely unexpected by definition could qualify as anything like dark matter, because if such a finding can be predicted, its ‘dark’ aspect is already reduced. This would seem to depend on the nature of the prediction itself, in terms of its level of detail. By referring again to the original source of the dark matter analogy in astrophysics, both observation and theory can combine to predict that there are missing pieces in any scientific framework. But the nature of what is missing might still remain quite enigmatic, at least at the outset. So the ability to make accurate predictions in themselves will not necessarily banish the ‘dark matter’ lurking beyond known frontiers. If we took the absolute maximum human life-span to be around 120 years, it’s obvious that no-one living could claim to have been alive during the publication of Darwin’s Origin of Species (1859) or anything prior. Some very elderly ‘super-centenarians’ (110+ years of age) surviving today were alive during the re-establishment of Gregor Mendel’s genetic discoveries in 1900, although they were all very young at that time. (And few people outside of the biological professions would have been aware of this, in any case). So it is then striking that the above linear scale immediately shows that most of these major biological findings cluster within a period of 40 years – easily within an average human lifetime. 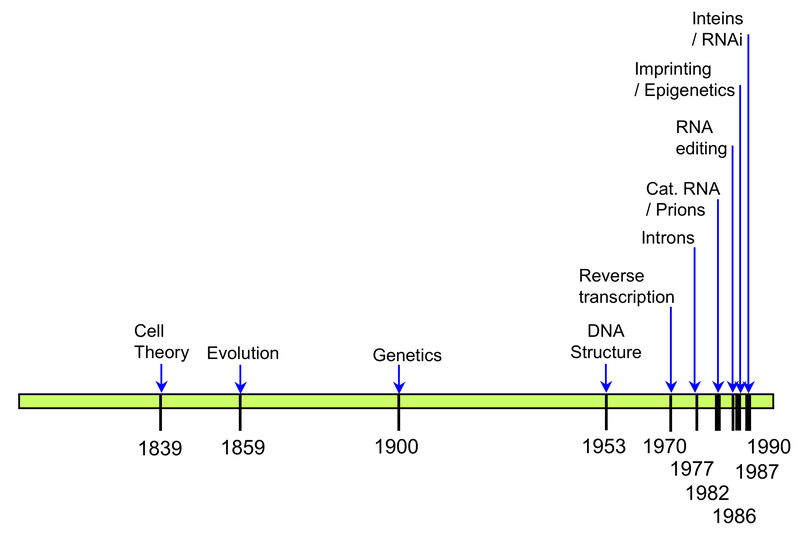 The acceleration of bio-discovery has accordingly been dramatic, and is necessarily accompanied by a continual up-grading of the overall paradigm for biology. Now, after so much novel information, could biologists be relatively blasé about further ‘dark’ discoveries? It might indeed be proposed that in the wake of so many ‘revolutions’ it becomes hard to jolt biologists accustomed to the emergence of cascading novelties within a relatively brief period of time. One implication of this takes us back to Thomas Kuhn’s Structure of Scientific Revolutions (noted in the previous post), where acceptance of new paradigms is not complete until the passing of the older cadre of scientists and the rise of a younger generation more willing to accommodate radical change. At least, this applies at the beginning of their careers, not necessarily later. As the new Young Turks themselves age and fossilize in their ways, they in turn become resistant to up-ending the scientific status quo, requiring a new cycle of generational baton-passing. But this view is not tenable when the pace of discovery (encompassing quite remarkable adjustments to the biological world-view) is well within a biologist’s working lifetime, let alone the longer perspective of history. Of course, this opinion could be countered by claiming that biological findings within the last 40 years are not actually definable as true paradigm shifts after all – but if so, it would be hard to find anything in biology which really qualifies as such. If a novel finding was thought to be truly remarkable, would one expect to find that reflected in the title of the first publication describing such a discovery? The ideal for a scientific publication is in the form of dispassionate report, but sometimes emotive terms creep into the titles of papers. As an example, consider the word ‘amazing’, which (at the time of writing) yields 191 hits in PubMed publication titles. Although this is often clearly hyperbole, it has indeed occurred for unexpected findings of great impact, including one of the events noted in the above time-scale diagram. This was a 1977 paper from the laboratory of Richard Roberts, which referred to an intron (interrupted coding gene sequence) as ‘amazing’ in its title. And indeed, at the time, few would have questioned that this was indeed a quite amazing and hitherto unsuspected development. But certainly no longer, of course. A couple of publications emerging in 1982 can be cited as inaugurating two quite different biological advances, both of which were to ultimately win Nobel Prizes for their originators. Specifically, these are the description of RNA catalysis (ribozymes), and the establishment of the ‘prion hypothesis’ as an explanation for the nature of certain enigmatic infectious agents. Before 1982, many biologists would have considered the notion that RNA could take on catalytic roles, previously known only for proteins, as weird or ‘off the wall’. And yet this general idea had already been considered by some far-seeing thinkers in the field. Of course, such speculation, even if based on perfectly reasonable logical grounds, can be easily dismissed in the absence of any tangible evidence. But such evidence indeed came from the lab of Tom Cech, who found that an intervening sequence in a gene in the single-celled protist organism Tetrahymena could splice itself out (from the longer RNA sequence in which it was embedded) in the absence of any protein catalyst. Virtually at the same time, the lab of Sidney Altman independently found another instance of RNA-based catalysis in the processing of precursors of transfer RNAs (RNAse P). Soon after, catalytic functions mediated by RNA were shown to true enzymes, and so the term ‘ribozyme’ for ‘RNA enzyme’ was coined. Despite its novelty and many ramifications, the very existence of catalytic RNA per se was rapidly accepted. The initial findings could be readily verified by in vitro experimentation, and a rational explanation for the chemistry involved was soon derived. In addition, the ability of RNA to act as a catalyst was a major factor in the proposal that an ‘RNA World’ was an early stage of molecular evolution prior to the development of the DNA/RNA/protein world familiar today. The story with the prion hypothesis is rather different. This proposal from the lab of Stanley Prusiner was developed in response to the observed peculiar behavior of certain infectious agents then termed ‘slow viruses’. These agents were demonstrably infectious, and caused a number of fatal neurological diseases in humans and animals, most notably scrapie in sheep, and kuru and Creutzfeldt-Jakob disease in humans. (The latter has a both a ‘classic’ form, and ‘new-variant’ pathology associated with so-called Mad Cow disease). Although initially considered as viral in nature, the resistance of these agents to physical treatments which would be expected to inactivate nucleic acids and any conventional virus was perplexing. Combined with the minute size of the infectious particles and other data, Prusiner proposed that agents of this type were fundamentally proteinaceous in nature (and hence the term ‘prion’ was coined). Proposing this was one thing – to the broader research community, a radical claim to the effect that an infectious agent could lack nucleic acid would need much backing before acceptance. To use a phrase coined by the late great Carl Sagan, “extraordinary claims require extraordinary evidence”. Prusiner’s group and others began to accumulate the required evidence. The protein component of mammalian neurological prions (PrP-c) was identified, and it was shown to be capable of existing in both its normal conformational shape and an aberrant conformation associated with prions. It was inferred that the prion replication occurred by ‘instructing’ the normal PrP-c protein into assuming the pathological prion state, consistent with the observation that mice engineered to lack the prion protein were completely resistant to prion-mediated disease. The replication of prions was thus held to be at the level of transmission of a particular protein conformation, not replication de novo. In other words, a prion cannot replicate itself without a supply of the normal protein, in its normal (non-replicating) conformation. But there were still long-standing problems with demonstrating that isolated prions (made by independent recombinant means) preserved the infectivity predicted by the prion hypothesis. As a result, some groups continue to dispute the prion proposal in favor of more conventional viral origin, where the PrP-c protein is required as a viral receptor. Nevertheless, more and more evidence continues to support the prion hypothesis, and those who continue to dispute its central platform are in a distinct minority (see References & Details). So these two cases exemplify differences in acceptance due to available evidence, and the ease of reproducing reported findings. While it could be argued that both RNA catalysis and prions emerged from prior unanticipated ‘dark matter’, there was at least theoretical discussion of the former before its actual discovery. The relatively slow acceptance of the prion hypothesis correlates with its degree of divergence from prior molecular biological consensus, and therefore, prior to their definition, prions indeed qualify as an area of biological dark matter. But now prions and the mechanisms of protein conformational transmission will also continue to move into the new (extended) general molecular biological ‘paradigm’. This, of course, applies to all discoveries, radical or ho-hum. And leads us to the next subsection…. 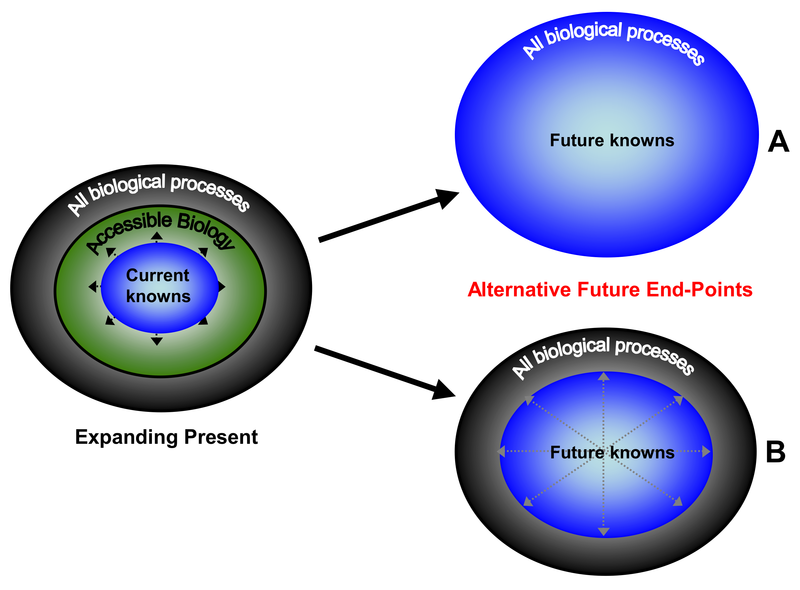 At some point in the future, this assumes that all biological factors and processes will become understood and accounted for by biological sciences. The only difference between alternatives A and B above is the question as to whether certain biological phenomena will remain inaccessible to full human understanding, at least for the foreseeable future. I should make it clear that it seems most unlikely that the remaining unknowns in biology, both at the molecular and higher developmental levels, will escape our reach in the relatively near future. Certainly some enigmas, such as the origin of life, may be virtually impossible to prove definitively, but it is highly likely that very plausible chemical models will be developed. The only potential issue here which might prove to be ultimately inaccessible is (in my opinion) the phenomenon of human consciousness, which itself is undeniably a product of biology. But that is a topic for at least one dedicated future posting. This diagram, though, naturally brings in the notion of the limits of biology, of the extent of biological phenomena. If life is found elsewhere in the universe, the whole area will clearly be greatly extended – perhaps indefinitely. But the above diagram is based on life ‘as we know it’ here on this planet: a closed (if very large) box, whose contents are the products of several billion years of biological evolution. This kind of consideration brings to mind a 1996 book by John Horgan (The End of Science), which proposes we will inevitably exhaust the gamut of things to discover in scientific endeavors in general. While the ‘Horganic’ notion that scientists will run out of things to do can be challenged in many ways, it seems reasonable to believe that all the major remaining unknown gaps in biology at least (with the above caveat for consciousness) will be filled, and in the not-too-distant future. This is not to say that everything in biology will finish up – it applies to the big-picture view of how all important biological processes operate. Within that large umbrella of themes, virtually limitless diversity could in principle exist, but all would be understandable and reconcilable within the end-stage paradigm for biology on Earth. And in any case, biology even now is moving from the stage of studying and understanding to the arena of artificial creation and manipulation – or synthetic biology, certainly an open-ended field if ever there was one. (And undoubtedly also a topic for future postings). But it should never be forgotten that the very fact that Earth biology at least is a closed system makes this an absolutely unique period in human history in terms of the current explosion and acceleration of knowledge accumulation. No, you won’t regularly read or see this in popular outlets, but it’s true nonetheless. For example, this present time could be called the ‘genomic age’, where the genomes of complex organisms are routinely sequenced and annotated. There is no shortage of work for sequencers in continuing analysis of new genomes (and variants of known genomes) and this has driven the development of current massive turn-over, high-throughput sequencing technologies. But the consensus genomic sequences for a great many organisms, ranging from E. coli, yeast, nematode worms, cats, dogs, chimpanzees and us, have already been obtained. And this very short period of genomic discovery will not see its like again in history. Continue to perplex and amaze? ‘…this idea had already been considered by some far-seeing thinkers in the field.’ These were Lesley Orgel, Francis Crick, and Carl Woese. A brief history of some aspects of this has been provided by Orgel and Crick (1993). Catalytic RNA references: For the relevant Cech paper, See Kruger et al. 1982. The paper from the Altman lab (Guerrier-Takada et al. 1983) was not published until 1983, but the work was done concurrently, and both Cech and Altman shared the 1989 Nobel prize for Chemistry for their discoveries. 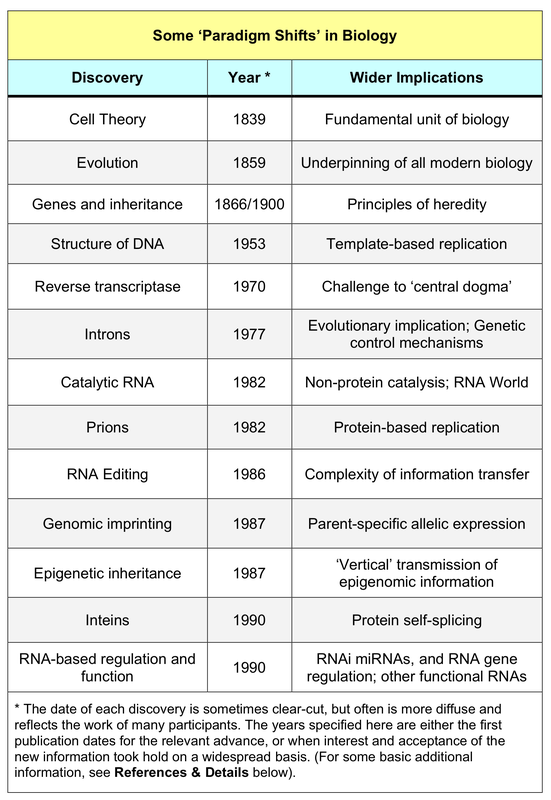 For a discussion of the RNA World, see Joyce 2002. Introduction of the term ‘prion’: See Prusiner 1982. For a more recent prion review, see Aguuzi & Calella 2009. Among the body of evidence in favor of the proteinaceous nature of prions as infectious agents, a recent paper (Wang et al. 2010) showed that bacterially-produced prions were indeed infectious, provided they were accompanied by certain lipids and RNA. Probably the most prominent dissenters against the prion hypothesis have been the group of Laura Manuelidis (for example, See Manuelidis et al. 2007). “…extraordinary claims require extraordinary evidence”. Carl Sagan referred to this general principle in his book, The Demon-Haunted World. Science as a Candle in the Dark. 1996, Headline Book Publishing. This dictum was mainly intended to refer to ‘paranormal’ claims, which have never been substantiated when subjected to rigorous scientific analysis. But it can be applied in any cases of ‘paradigm-challenging’ findings, with the important implication being that an extraordinary claim – even one which initially seems far-fetched and dubious – will in time come to be acknowledged and accepted if properly documented and reproducible evidence in its favor is provided. John Horgan book: (1996) The End of Science. Facing the Limits of Knowledge in the Twilight of the Scientific Age. Addison Wesley. An attempt to explain Prof. Fritz-Albert Popp’s work on biophotons and Prof. Persinger’s work on magnetically induced “anomalous” events. Where matter exists, chemistry also exists. Axion particles may yield axion chemistry, involving monopoles also in the place of electric charges. Electrons, protons and neutrons may have corresponding axion particles. Just as electrons are universal constituents of all matter, axion-like particles parallel to electrons may be universal constituents of the biosphere. In addition, animals will have axions parallel to protons also. Humans will have axions parallel to neutrons as an additional third component. The most stable (the least reactive) dark-matter body exists only in humans. Plants will have the least stable dark bodies. Animals come in between. The interaction of the “dark” and “light” chemical bonds can produce extremely low (ELF) photons. Astrophysical dark-matter (excluding axion-like particles) has nothing to do with Bio dark-matter in the biosphere. Here one looks for biophotons (not gamma or X rays) from living cells in a petridish under various conditions- normal, healthy, sick, sudden death, different low magnetic fields, high magnetic fields etc. An experiment can be easily dsigned to detect “magnetricty” from plants, animals and humans, which will differ by an order of magnitude acros the taxa. 2. Decoupling at death leaves the “dark body” dormat at a relatively negative energy state (- E= mC^2 ). 3. Quickening is possible by a vast external live-source of energy. 3. Philip Benjamin, Dark Matter & Dark Chemistry NeuroQuantology September 2007, Vol 5 # 3, 322-326. 4. Philip Benjamin, Dark Chemistry or Psychic Spin Pixel? NeuroQuantology, June 2007, Vol. 5 # 2, 197-204. 5. Philip Benjamin, Mind Matter, Noetic Journal Vol 4 # 4, 351-360, 2003 [Nobelist Sir John Eccles Centennial Edition]. This comment is suggesting that ‘dark’ physical particles may influence biological phenomena in various ways – but there is no evidence in support of this. It’s important to note once again that my initial discussion of ‘Dark Matter’ in Biology (previous post to this one) raised the area of physical dark matter as an analogy with ‘dark’ areas within biology, NOT in any direct sense. 1. Biophoton energies are lower than the lowest known biochemical, or bioluminiscent or chemiluminiscent energies. So, it cannot be an ordinary chemical phenomenon. 2. Biophoton emision rates are vastly different acorss the taxa, plants emitting 10 times more than humans per sq.inch/second. So it cannot be a DNA phenomena, since DNA structures are practically the same across the taxa. 3. From stability factors and differential distribution of three different axion-like bio dark-matter particles a simple equation can be derived which agrees with the observed emission rates.